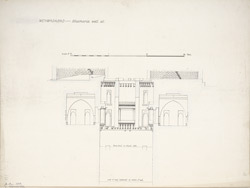 Cross section illustration of the Bhamaria well from James Burgess' 'Original Drawings [of] Muhammadan Architecture in Gujarat.' The Bhamaria step-well, located at Memudabad in Gujarat, was constructed in the fifteenth century in the period of Sultan Mahmud Begada (r.1459-1511). The step-well consists of an octagonal shaft, of 14 feet across, from where water could be drawn. ?On all four sides op the opening there were circular rooms?those east and west of 10 feet 8 inches diameter inside, and the other two of them had, in the openings, the troughs referred to. Outside, on the platform four stairs descended to a lower storey, in which were eight rooms round the shaft: those in the corners 8 feet square; two, east and west of the shaft each 12 feet 4 inches by 7 feet; and the other two 14 feet 7 inches by 7 feet 6 inches. These last four are each crossed by two Saracenic arches, and each has a neat balcony window into the shaft of the well.